Keystone College received a B.
Washington Monthly's ranking of 74 out of 346 of Baccalaureate Colleges - Overall Rank was a major contributor to this grade. 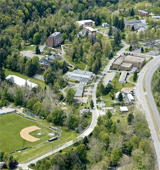 Keystone College is college with 1574 students located in La Plume, PA.
What is a typical Keystone College student like? Describe the type of person that should attend Keystone College. What are the top 3 reasons someone should attend Keystone College? What was a typical Keystone College student like in high school? Describe the type of person that should attend Keystone College. They are smart, they should have a job to help with anything they are going to need. Have the energy to go throughout the day even when they are sick. Voted as the region's "Most Beautiful Campus," Keystone has a diverse student body; over 1650 students from 14 states and 12 countries studying one of the many academic programs available online, on campus, and on the weekend. With a 10:1 Student/Faculty ratio, we have a reputation for creating a caring and supportive environment dedicated to our student's needs. Students can prepare for leadership and broaden their educational experiences through athletics, global learning opportunities, an extensive career development center, countless student activities and clubs and organizations. Our campus community enjoys a wide variety of educational resources, facilities, and opportunities that are also available to the public such as the Thomas G. Cupillari '60 Observatory, Chef's Table Restaurant, and more. What are the top 3 things that students do for fun at Keystone College? There is alot of activities on campus. But i will tell you the 3 that i can remember that was fun for me. Hiking, fys activities, and karaoke night. The average student pays $16,302 for tuition, fees, and other expenses, after grants and scholarships. Total stated tuition is $20,300, in-state and on-campus, before financial aid. Learn more about financial aid at http://www.keystone.edu/tuition_aid. Estimate the net price for you at http://www.keystone.edu/tuition_aid/tuitioncalculatorfreshmanstudents.dot. Keystone College participates in the NCAA Division III for college athletics. Want more info about Keystone College? Get free advice from education experts and Noodle community members.